Dr. Montessori began her work in 1907, over a century later the work remains relevant but most importantly it is continuing to grow as a worldwide solution for the developmental needs of children. MH (Montessori Hossegor) seeks to following in the footsteps of Dr. Maria Montessori by creating a school that fosters child development free from adult pressure and cultivating an environment in which, children are allowed to follow their instincts and natural human developmental needs. 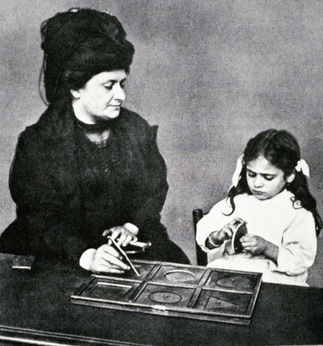 Maria Montessori was born in 1870 in Italy, a single child into a traditional family. She was born during the Industrial Revolution where the concept of individuality and speed was created in the mind of the common human being. These new changes were dramatically felt by the child. Family dynamics during this time shifted and changed as people now left the home to go and work. On January 6th 1907 she created the first Montessori School. Within one year, the school was world famous. She wrote a letter to every nation of the world and sought a social party for children, a ministry for children, and the rights of the child. She believed that “the true work of education is everlasting peace.” Before Dr. Montessori, no one had looked at the natural behavior of the child. She created an environment based on the needs of children and not on the needs of the adult.